It's time to reform our weapon laws. Each year in this country, thousands of people are victims of serious violent crimes, even murdered, because they are rendered defenseless by ill-conceived, unjust and draconian legislation. People are mercilessly prosecuted if they take precautions to protect themselves and their families, with many losing their freedom, their jobs and even their homes as a result. We are constantly being told that prohibitions on the private possession of weapons work and that we are all safer because of them. This is a lie. 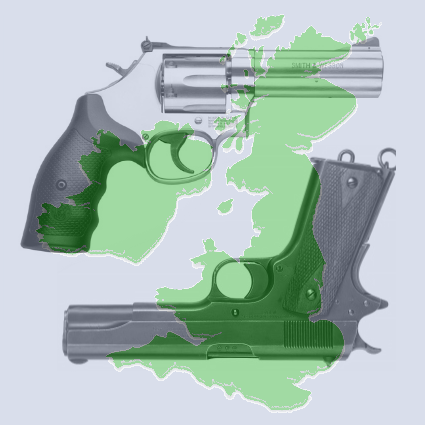 In 1970, police in England and Wales recorded 687 crimes involving firearms, excluding airguns and replicas. By 2005, this figure has jumped to 11,088 crimes involving firearms, again excluding airguns and replicas. A rise of 1,513 percent in just 35 years. The figures for crime involving handguns are even higher. 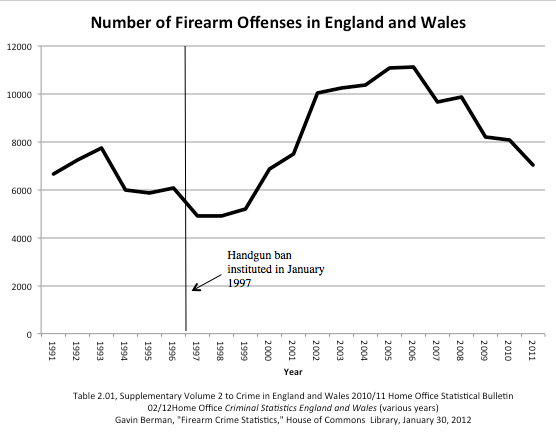 In 1970, just 213 crimes involving handguns were reported by police in England and Wales. In 2001, that figure had risen to 5,874 crimes. A shocking increase of 2,657 percent in just 31 years. 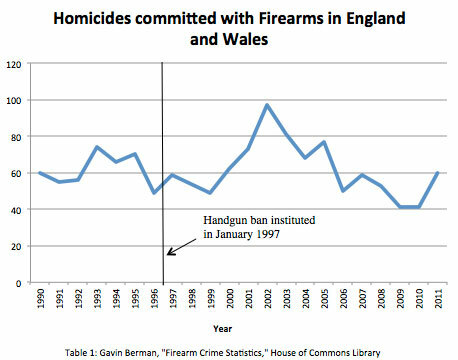 Back in 1997, when handguns were banned, we were told that it would lead to a safer, less violent society. Yet our society has seen no significant change in violent crime or homicide rates, with previous trends continuing unimpeded. We often hear claims that "the bad guys will arm themselves and everything will get worse if we allow people to own weapons for self-defense". This is another lie, designed simply to further the prohibitionist's cause. Countries where armed self-defense is legal have lower violent crime rates than countries where it is prohibited. 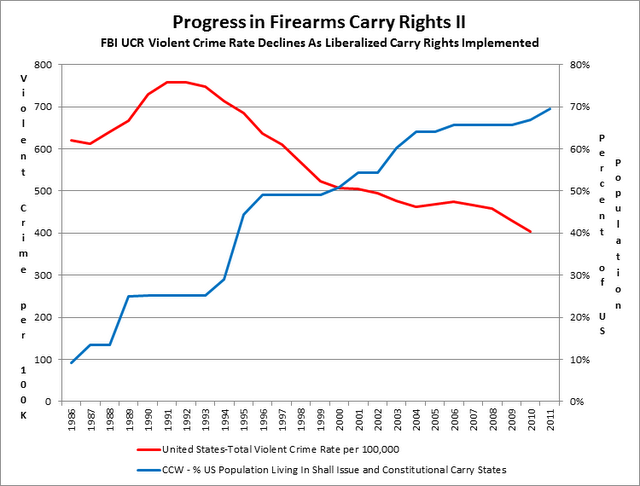 The same is also true within countries such as the US, where states with liberal weapon laws have lower violent crime rates than states with prohibitive weapon laws, and where the legalization of concealed carry has led to massive, nation-wide drops in violent crime and homicide rates. Surely we should look at reforming our weapon laws, with the aim of making them fair and sensible. - Graham Showell & The lizard. Chicago's crime rate plummets after Illinois legalizes concealed carry. Chicago, known for being the most dangerous city in the US, has seen a massive drop in it's violent crime and homicide rates since the legalization of concealed carry. - The first three months of 2014 saw 6 fewer homicides than the same time frame in 2013, a 9 percent drop, according to a statement from Chicago Police. - The first three months of 2014 saw 55 fewer homicides than the same time frame in 2012, according to a statement from Chicago Police. - Compared to the first quarter of 2013, there have been 90 fewer shootings and 119 fewer shooting victims, drops of 26 and 29 percent respectively, according to police statistics. - Compared to the first quarter of 2012, there have been 222 fewer shootings and 292 fewer shooting victims. - Overall crime is down 25 percent from 2013.